Kerala Cultural and Backwater Tour is a perfect glimpse of this strip of land mapped by brackish canals and lagoons, unique cultural heritage and natural wonders. Beginning from the spicy discovery of coastal Cochin (Kochi) including Chinese fishing nets and monumental heritage, the journey lands the travellers into the wetlands of Kumarakom. 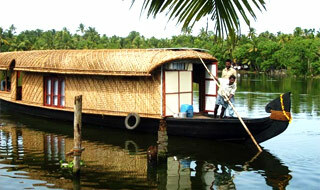 It's only here that the heavenly houseboat or luxury Kettuvallam experience waits for a tourist. This luxury houseboat is equipped with the food, accommodation and washroom facility, besides taking tourists through an enchanting experience of cruising on the backwaters. This journey, away from the grim realities of life, transports tourists on the way of calm and brings contentment in their hearts and souls. In fact, it is a cruise to find and identify the hidden self. The next experience on this enriching journey is a jungle patrol at Periyar. This region, owing to its rich wildlife and close proximity to the fragrant spice forests of Thekkady attract tourists from different parts of the world. One can sight herds of elephants wandering in their natural habitats. Towards the end, the tour wraps up itself in the sweet reminisces of Munnar and the magical bliss of Marari beach. Arrive Cochin (Kochi) Airport and meet the Incredible India Tour representative who will assist your transfer to the hotel. Cochin (Kochi), also known as the sea gateway of India attracted traders, travellers and invaders from the world over. Every grain of soil is ingrained with amazing snippets of history, culture and nature. The day is at leisure in the hotel. Optional excursion of the day includes a relaxing sunset cruise. Overnight stay in the hotel. Begin day 2 with the illustrious sightseeing to explore the many fascinating facets of Cochin (Kochi). These include Jew Town, the oldest *Jewish Synagogue in Asia, the oldest European church of India, St. Francis, Portuguese contribution of Santa Cruz Basilica, *Dutch Palace, spice market and the 15th century Chinese fishing nets. This illustrious sightseeing gets a perfect cultural seasoning of Kathakali, the traditional dance drama ruled by emotions in the evening. The unique thing about this performance is the dramatized depiction of stories, epics and episodes related to Indian mythology. The story is narrated before performance, so that tourists can enjoy the performance thoroughly. The make-up of the artists performing in this event also is an attraction of this performance. Prior to the drama, they take hours of time to slip into the character they are playing with heavy gear, extensive make up, powerful expressions and hand movements. Overnight stay in hotel. *Jewish Synagogue is closed on Friday and Saturday. *Dutch Palace is closed on Friday. Morning you will be transferred from Cochin (Kochi) to Kumarakom, a thriving backwater destination blessed with the bird sanctuary and an innocent rural backdrop. On arrival, check into the resort and relax for the remaining day. The views of backwaters from the resort are as enticing as the backwaters itself. The maze of canals, lagoons, rivers and stream rivulets catch your fascination regarding the blissful backwater you are going to experience the very next day. Day at leisure and overnight stay in the hotel. Embark on your luxurious Kettuvallam, the eco-friendly houseboat engineered for snaking on the maze of backwaters full of canals, lagoons, lakes, coves and rivulets. These houseboats are well-versed in offering you the complete comforts of accommodation, food and daily amenities. All comforts are taken care by the staff in the houseboat, while you do the most important task of your life, relax and unwind your worries in the company of enchanting scenes of the rural Kerala. You can sink into the bed or relish the spicy local food on board. Or step out on the deck to marvel at the palm fringed landscape and sunbathe. Overnight stay in the anchored houseboat. Early morning disembark at Kumarakom and drive to Periyar, the destination known for undulated hills, Thekkady spice forest and sightings elephant gangs. Periyar is one of the oldest valleys in Thekkady and a home for many rare wild species. On arrival at Periyar, drive into the hotel. Later this day, spice plantation tour can be availed during which you will get to sense the aromas of cinnamon, cardamom, pepper and nutmeg in their natural forests. You can even find out more about how they are grown, harvested and processed before they reach in the finished way to supermarkets. Elephant ride in the forests is an optional excursion. Rest of the day at leisure. Overnight stay in hotel. The escorted jungle patrol in Periyar is the best way to trace tigers and elephants in their reserve habitats. The other species to look out for during the patrol includes sighting gaur, Nilgiri tahr, sambar (horse deer), Dholes (Indian wild dogs), mongoose, foxes and leopards. In the evening, boat ride can be availed where you will get the opportunity to sight elephants and other animals along the bank. Overnight stay in hotel. 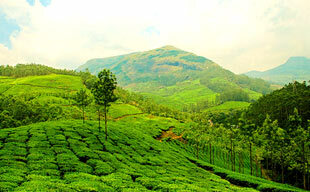 Post Periyar excursion, a four hr drive across 130 km takes you through mesmerizing beauty of Munnar. 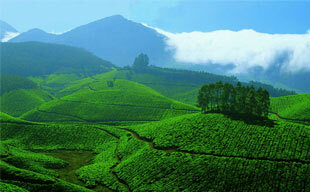 The hilly area is a home to Anaimudi, south India's highest peak, wishful waterfalls and aromatic tea estates. Post lunch, visit the famous tea gardens and enjoy the brews of the destination. Overnight stay at hotel. Post breakfast, leave for the sightseeing of Munnar in depth. Eravikulam National Park in Munnar is the best natural reserve to spot the mountain goat of south, Nilgiri Tahr. Also, visit Matupetty Dam on the confluence of three rivers. Overnight at the hotel. After breakfast, drive to the picturesque fishermen's village of Mararikulam and check into your resort. Nestled on the quiet and lush coconut groves on the pristine white beaches, Mararikulam or fondly called Marari offers a perfect retreat for relax amidst balmy surroundings. Day is at leisure on the beach resort. Overnight stay in hotel. Spend second day lazing in the resort or sunbathing on the Marari beach. You can even enjoy fishing in the leisure time. Overnight stay in hotel. After breakfast, depart Marari for Cochin (Kochi) where you will return with the incredible memories of the India tour via flight / train.